Last weekend, Google had a social media FAIL. They used their ability to reach into your content and your user interface to do a little marketing. However it turned out to be a pretty insensitive move on their part and they've been feeling the backlash. Their actions dug deep into people's hearts and tugged at some very raw emotions in the worst way. Luckily they kept from going all the way, which could have had some disastrous consequences. But I'm getting ahead of myself. Let's back up to the beginning. And that's fine. If you still have a Dad. Right? But in my case, had they done that on, say, Mother's Day... let's just say that I would have been much less objective writing this blog post. So you might be thinking: how is this different from receiving an email newsletter or seeing a commercial touting Father's Day gifts? It's very different because this reaches you in a very personal way: right inside your Gmail. We sign away our content and our personal information to use free apps like Google Search, GMail, Google Chat, Google Calendar, etc. And Google can in turn leverage what they know about us to target ads. But there's a fine line between marketing you can see (sponsored links in Gmail) and subtle, invasive marketing (adding a task to my task list telling me to buy something or use a product). But it could have been much worse. 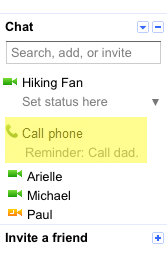 If you think about it, Google was really only one step away from creating a Google Calendar item for you and then popping up a personal reminder to call your Dad. How devastating would that have been to someone who'd lost their Dad - to wake up Father's Day and their calendar tells them to call him? While this is better, I personally think it's only slightly better than that. Social Media Marketing is a tricky thing. Just ask Nestle, Marie Claire and countless others who've had very public fails in the social mediasphere. With a single action (or lack thereof) it's possible to alienate scores of customers and potential customers. Personally, despite the backlash, I think that Google will easily rebound from this. In fact, you might not have even heard about this FAIL before you read this. But I hope you keep your eyes peeled for invasive social media marketing tactics. And I hope Google has learned their lesson and will be more sensitive in future campaigns.